A ready demand for Charolais at Dungannon on Friday 2 November saw bull prices top at 5,800gns with an of average of £3,335 for the 34 sold – eight more than last year’s corresponding sale. Two herd reductions added to the female tally with 15 heifers selling to a top of 6,500gns and averaging £3,269, while the three cow and calves on offer averaged £4,900. Leading the bull lots at 5,800gns was the junior and reserve supreme champion Kiltybane Norman from Seamus and Aidan Bellew, Cullyhanna, Co Down. 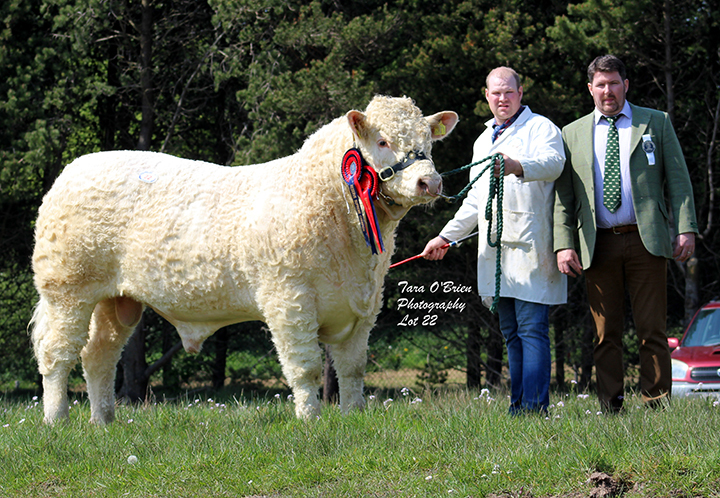 Norman who was purchased by Kevin O’Neill, Dromore, Co Tyrone, is an August 2017 born son of the 16,000gns Royal Welsh show reserve male champion Anside Foreman and Kiltybane Flora, a daughter of the Great Yorkshire show interbreed champion Cretlevane Albertz. Hillviewfarm Nougat, a blue ticket winner from Adrian Richardson, Maguiresbridge, Co Fermanagh, was the next highest priced bull at 5,200gns. The 17 month old Nougat is sired by the popular, easy calving and short gestation Blelack Digger, while his dam is the French-bred Harestone Tyrol-sired and Scottish-born Elgin Elisha. He goes on to work in Donegal, Eire for new owner Dessie Graham. Next in the trade stakes at 4,900gns was the April 2017 born Brigadoon Neptune, who had also stood second in his class at the pre-sale show. Purchased by Andrew Canning, Dungiven, Co Derry, he is out of Rossmore Urbane, who goes back to Doonally New and is sired by the 10,000gns Stirling reserve junior champion Goldies Icon. 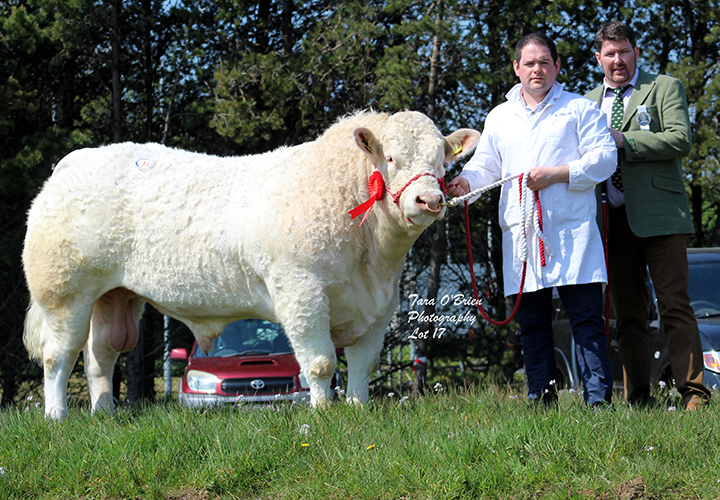 He was consigned by breeders Albert and David Connolly, Ballynahinch, Co. Down. The Connolly’s had a good day, with the two lots they had on offer, averaging £4,987.50. 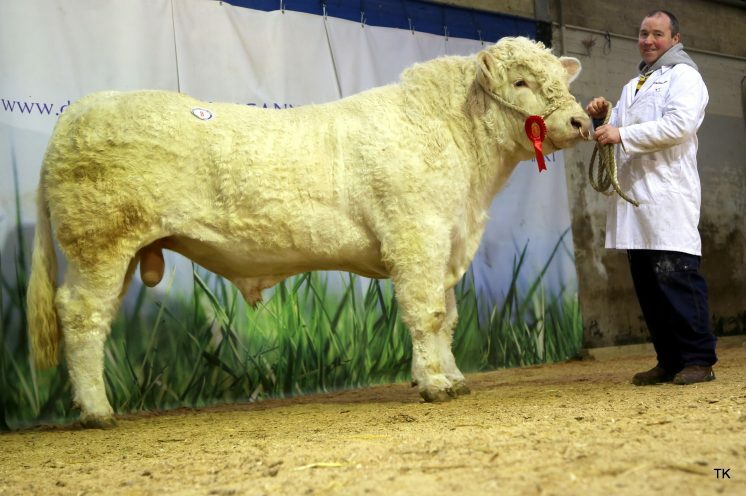 Their other consignment, the 18 month old Brigadoon Nemesis who was snapped up by Colin Maxwell, Downpatrick, Co Down, for 4,600gns, is sired by the Royal Ulster show supreme champion Brampton Petition and out of the Irish-bred Royal Gemma. The reserve junior champion Brogher Nevada from Trevor Phair, Bellanaleck, Co Fermanagh, was next in the trade stakes at 4,800gns. The breeding here includes Vexour Freddy on to the home-bred Brogher Gemma, who goes back to the 10,000gns Perth supreme champion Thrunton Bonjovi, and this October 2017 born lad was purchased by RW Robertson, Newtownards, Co Down. 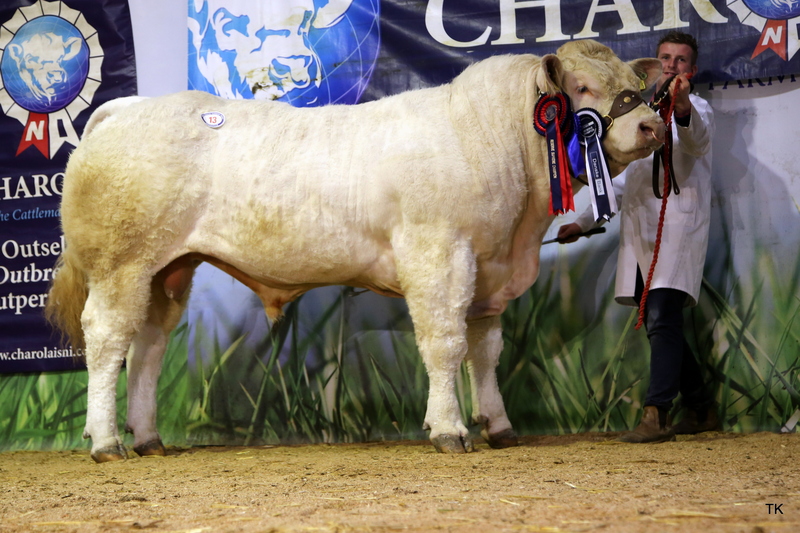 Three bulls were knocked down at 4,000gns a piece and the first was the pre-sale show reserve senior champion Skinboy Napoleon. 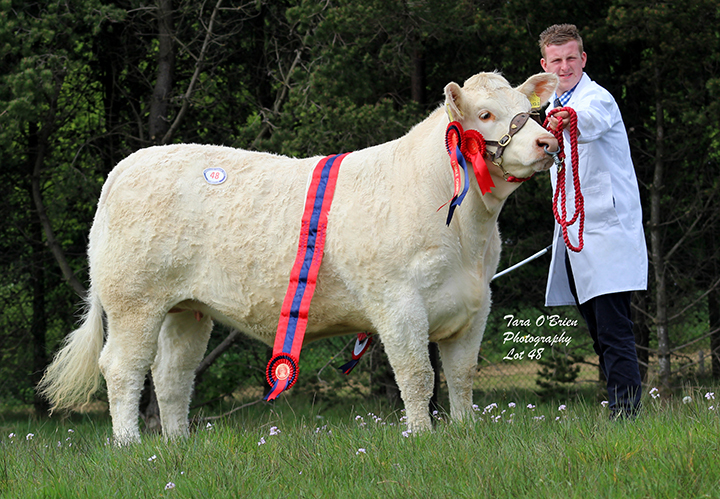 This April 2017 born son of the 55,000gns Royal Show supreme champion Thrunton Voldemort and Dunlon Ulick daughter, Skinboy Ellen, was bred and consigned by Seamus Houston, Douglas Bridge, Co Tyrone, and Derek Campton, Dunmore, Co Tyrone, was the successful bidder. Also commanding a 4,000gns bid, this time from Andrew McCammond, Templepatrick, Co Antrim, was James McBride’s Moorlough Nougat from Strabane, Co Tyrone. 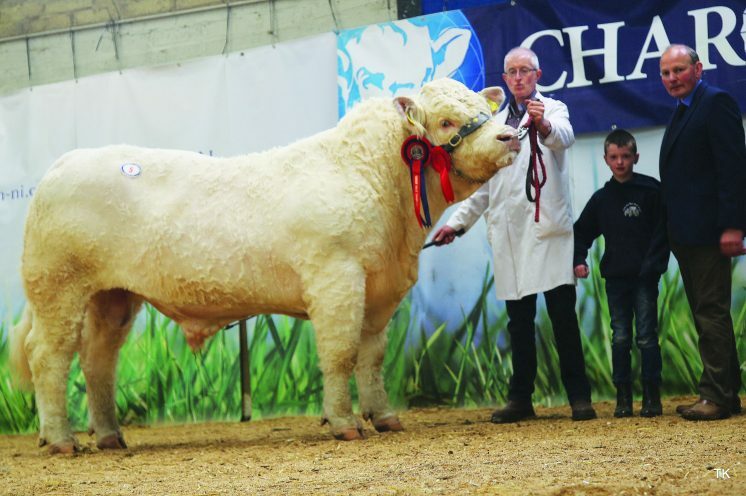 The 16,000gns Stirling junior champion Clyth Diplomat is the sire of this 17 month old lad who stood second is his class at the pre-sale show, while is dam is Moorlough Heighlight, a Thrunton Voldemort daughter. Matching the 4,000gns price tag was another blue ticket winner, the 16 month old Killadeas New. His dam Killadeas Dawn is a home-bred daughter of the Dungannon supreme champion Glencoe Victor and he is sired by the 8,000gns Blelack Blackberet. Bred and exhibited by Stuart and David Bothwell, Ballina Mallard, Co Fermanagh, he heads on to Castlewellan, Co Down, to work for M and E Rice. The next lot, Sandelford Neeson, who had headed up his pre-sale show class, was knocked down sold at 3,800gns to Daniel McAllister, Ballycastle, Co Antrim. George Henderson, Bushmills, Co Antrim was the consigner of the June 2017 born Neeson, who is by the 26,000gns Balbithan Vespasian and out of Sandelford Finessa who goes back to the 14,000gns Goldies Usher. A pair of bulls sold for the next highest price of 3,400gns with the first being an April 2017 born Blelack Digger son from John, Ivan and Ryan Elliott, Newtownstewart, Co Tyrone. Drumlegagh Nero, whose dam Deeleview Helen is sired by the French-bred Suzeringie, was purchased by TJ McLernon, Crumlin, Co Antrim. 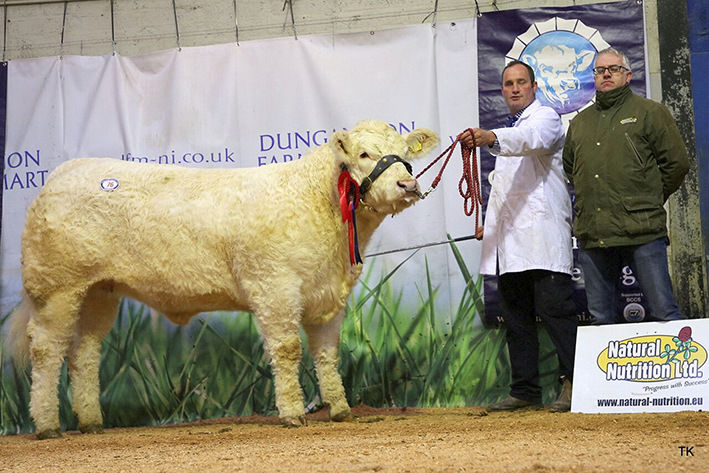 The second to sell at a 3,400gns price tag, was another Digger son, Drumconnis Necleus who had been awarded the reserve intermediate championship title earlier in the day. The 30,000gns Balmyle Bollinger-sired Drumconnis Ida is the dam of this 15 month old from John McGrath, Dromore, Co Tyrone, who stayed local when purchased by Kevin O’Neill, also from Dromore. 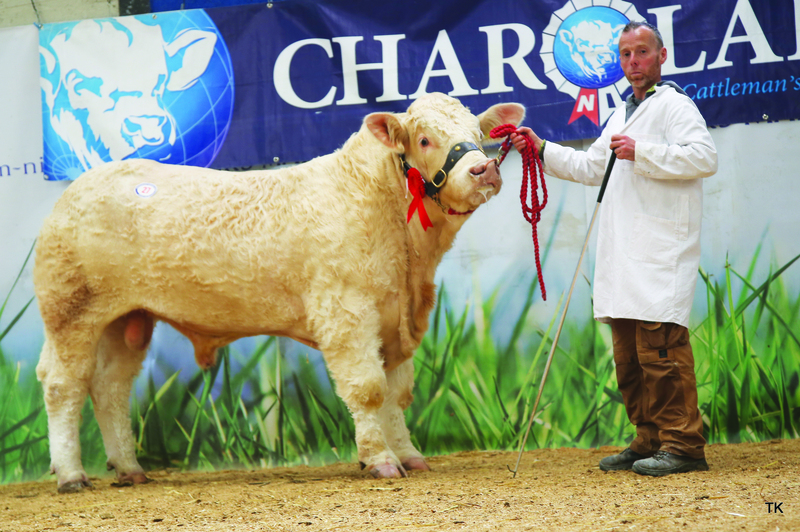 There have not been many Charolais females on offer at Society sales this year and the purchasers were keen to grab one while they had the chance. The drafts from the Hillviewfarm and Glencoe herds fuelled the interest and Adrian Richardson and Son’s heifers topped the lots. Heading up the prices at 6,500gns for the Richardson family was the two year old Hillviewfarm Millie. Sired by the aforementioned Blelack Digger, and out of the 25,000gns Perth supreme champion Mowbraypark Orlando-sired Hillviewfarm Iona, she was snapped up by Colin Todd, Lisburn, Co Antrim. With another three heifers selling to new homes, the Richardson’s enjoyed a great trade and sold the four to average £5,486. The next at 6,200gns was another of their lots, with the same sire behind her. Hillviewfarm Margaret, who is out of Hillviewfarm Dawn, a daughter of the 15,000gns Carlisle supreme champion Burradon Talisman, heads over the water to Roebuck, Yorkshire, with new Charolais breeder David Timm, who went on to purchase two out of the three Hillviewfarm cow and calves on offer. The highest priced at 4,800gns was the mother and daughter pair Hillviewfarm Dawn – the dam of the previous mentioned lot – and her eight month old heifer calf Hillviewfarm Olive who is sired by Mowbraypark Orlando. 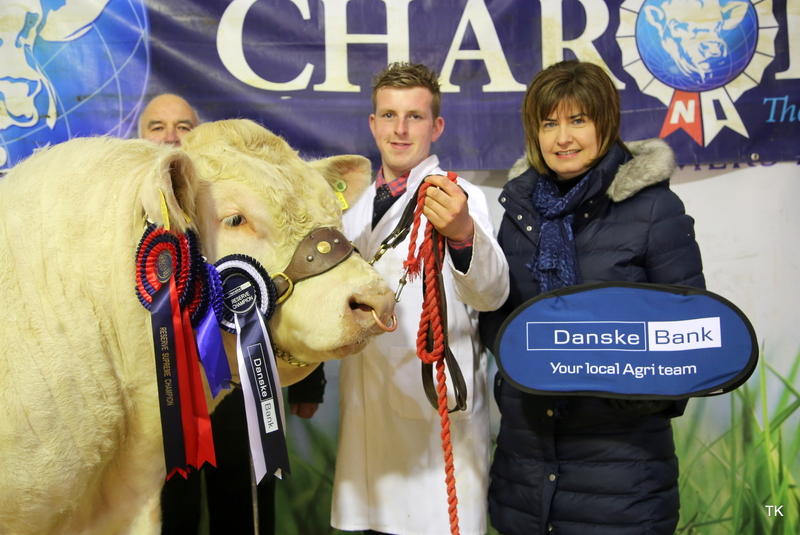 The top lot in the main heifer consignment and commanding a 4,800gns bid from Clare Ferris, Millisle, Co Down, was the Female Champion Killadeas Nancy from Stuart and David Bothwell. The 16 month old Nancy, is sired by the abovementioned Blelack Blackberet and out of the Doonally New daughter Killadeas Faithful. Also in the money at 4,500gns, was the youngest heifer of the sale, the November 2017 born Glencoe Nelly from Paddy and Valerie McDonald, Killeavy, Co Down. A daughter of Clyth Diplomat her dam is the Bova Banker-sired Glencoe Jenny and she was purchased by Denis Quinn, Cookstown, Co Tyrone. Averages 34 bulls £3,335, 15 heifers £3,269, three cow and calves £4,900. Judge: Mark Ross, Gorebridge, Midlothian. 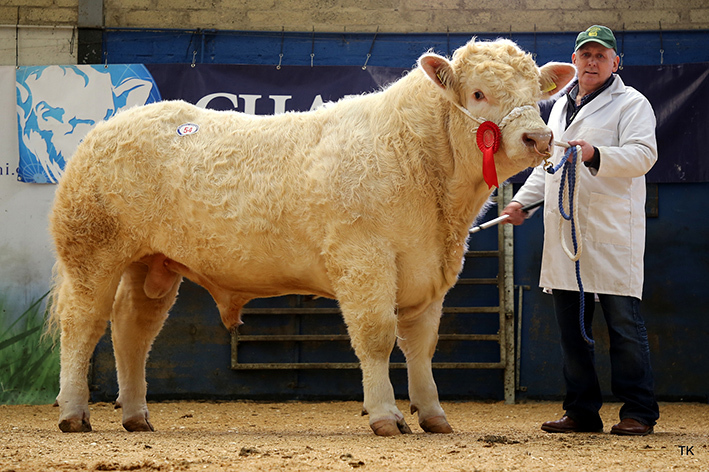 13 Bulls sold to a top price of 4,500gns and an average of £2,835 at the Northern Ireland Charolais club spring sale at Dungannon on Monday 7 May. 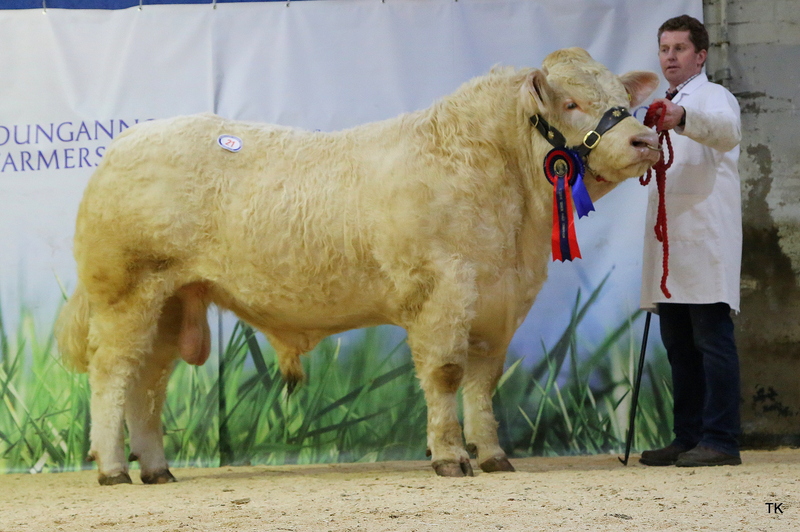 Topping the lots at 4,500gns was a 16-month-old entry from Jonathan Crawford, Maghera, Co Derry, who earlier in the day had been crowned supreme and junior champion in the pre-sale show. Coolnaslee Noel, who is the first son to be sold from the 50,000gns Balthayock Justice, is out of Coolnaslee Hanna, a daughter of the 55,000gns Balmoral interbreed champion Sportsmans Columbo and was purchased by Ian Gouldy, Greyabbey, Co Down. Next in the trade stakes at 3,600gns and purchased by Nigel Smyth, Randalstown, Co Antrim, was the 14-month-old Dernaseer National, who was bred and exhibited by Dominic Arthurs, Dungannon, Co Tyrone. Bred out of the 18,000gns Perth intermediate champion Fury Action daughter Dernaseer Dorreen, he is sired by Palace Garfield. The days senior champion came from Trevor Phair, Bellanaleck, Co Fermanagh and sold in a 3,400gns deal. Brogher Master, a November 2016-born son of Vexour Freddy and Brogher Eva, who goes back to Prime Roberto caught the eye of Mr A Loughran, Cookstown, Co Tyrone. Just behind at 3,100gns was the class winner Ovill Neymar. D Brown, Springfield, Co Fermanagh, was the man behind the money on the purchase of this 14-month-old, by popular AI sire Davally Illusion, bred out of the Doonally New-sired Ballymakea Carmel, from the O’Kane Bros, Dungiven, Co Derry. The reserve supreme and reserve junior champion Drumlone Norman was another top priced lot, securing 2,900gns for breeder Kenneth Veitch, Lisbellaw, Co Fermanagh. The January 2017-born Norman is sired by Goldies Echo and out of Drumlone Hilda who goes back to Oldstone Egbert. He goes on to work in Tempo, Co Fermanagh for Mr C Fee. Purchased at 2,500gns by S Murphy, Mullaghbawn, Co Down, was another Balthayock Justice son from the aforementioned Jonathan Crawford. Coolnaslee Moonbeam who stood second in his class earlier in the day, is a November 2016-born son of Sportsmans Columbo daughter Coolnaslee Ganet. The female section was headed by the female champion and 20-month-old Derryharney Margharita from Harold Stubbs and Alan Burleigh, Crummy, Co Fermanagh. Margharita who is sired by the 8,000gns Blelack Blackberet and out of a 19,000gns Doune and Dunblane champion Corrie Alan homebred daughter Derryharney Jamboree, was purchased by George Nelson, Drumacritten, Co Fermanagh. 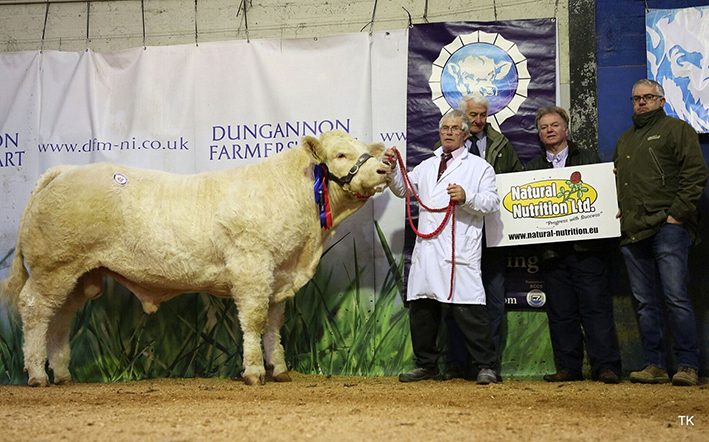 There was great trade for Charolais at the Northern Ireland Charolais Club sale at Dungannon on Friday 16 March. The sale which had been postponed due to the bad weather at the beginning of the month, saw an 86% clearance, a 9% increase on last year. The 38 bulls averaged £3,285 which was up from last year’s equivalent by £367 for five more sold. Leading the pack at 5,600gns and 5,000gns respectively were a couple of crackers from Jonathan Crawford, Maghera, Co Derry. The first Coolnaslee Manager, had been tapped out third in his class at the pre-sale show and caught the eye of O Jeffers, Cookstown, Co Tyrone. The August 2016-born Manager is sired by the 10,000gns Carlisle supreme champion Ratoary Ferguson, while his dam is the 30,000gns Dingle Hofmeister daughter Edenhurst Hrh, who was purchased from the Edenhurst dispersal in October 2015 for 8,000gns. 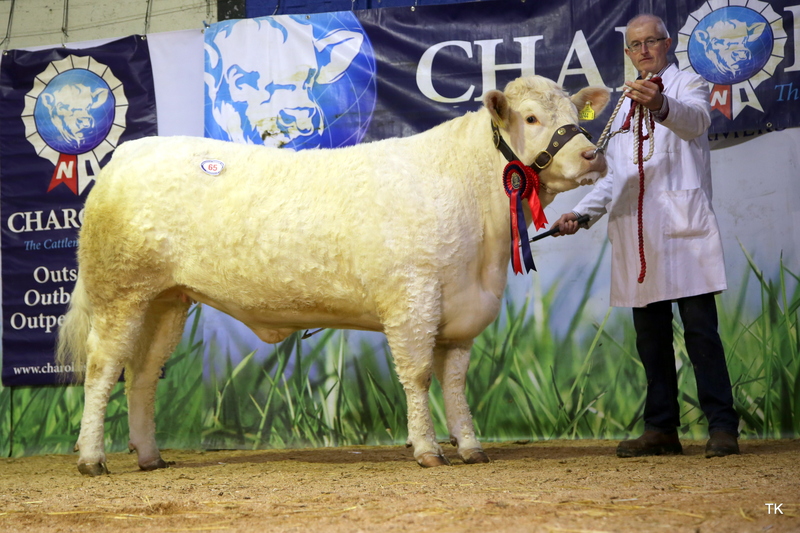 Mr Crawford’s 5,000gns bull was the reserve junior champion Coolnaslee Minto. Minto also boasts an impressive pedigree, being a son of 10,000gns Carlisle intermediate champion and Clogher show intermediate champion Ratoary Icebreaker and the 10,000gns Blelack Babe, who goes back to the 25,000gns Perth supreme champion and Royal Show junior male champion Thrunton Socrates. C Shaw, Carryduff, Belfast was the purchaser of this 15-month-old lad. 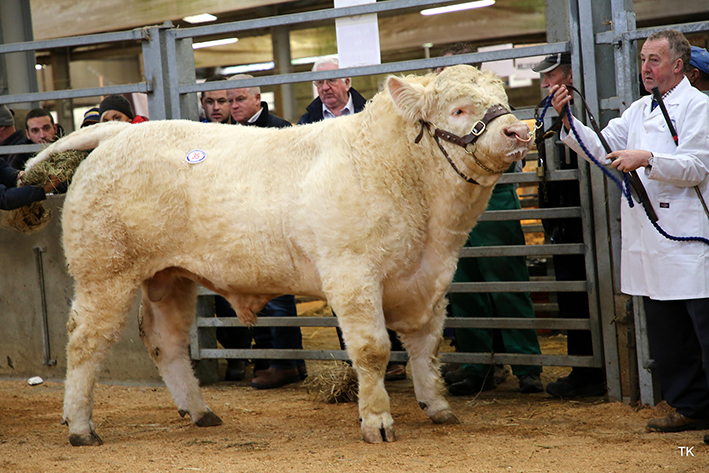 Two bulls secured a price of 4,800gns a piece and both came from Harold Stubbs & Alan Burleigh, Crummy, Co Fermanagh, who went on to sell a total of four to average £4,252.50. First up was the reserve supreme and reserve senior champion Derryharney Mustang, a 19-month-old who was the first to be purchased by the pre-sale judge Terry Coghill, on behalf of Mr Patterson, Feltigar, Orkney. The breeding here includes the 10,000gns Perth supreme champion Thrunton Bonjovi and the Balmoral Show supreme champion Goldies Carnival daughter Derryharney Hazel. The next Stubbs and Burleigh consignment which also secured a 4,800gns bid was the class winning, September 2016-born Derryharney Muncher. Muncher who is sired by the proven high performing, short gestation and easy calving Blelack Digger is out of Derryharney Jazzystar, who in turn is sired by the Fintona male champion Derryharney Happyharry. He heads on to Stranocum, Co Antrim, to work for John McHenry. J Smith, Randalstown, Co Antrim, was the next to snap up one of the Stubbs and Burleigh lots. The 18-month old Derryharney Mrmotivator, a son of the 22,000gns Newhouse Bigal and Thrunton Bonjovi daughter Derryharney Ipad, secured a bid of 3,600gns. and Woodpark Idele, a daughter of the 9,500gns Stirling reserve senior champion Woodpark Gregg. After his earlier purchase of the reserve champion, pre-sale show Judge Terry Coghill was again prepared to back up his judgement when he purchased the supreme champion Carrgene Muckian on behalf of Mr Featter, Westray, Orkney. 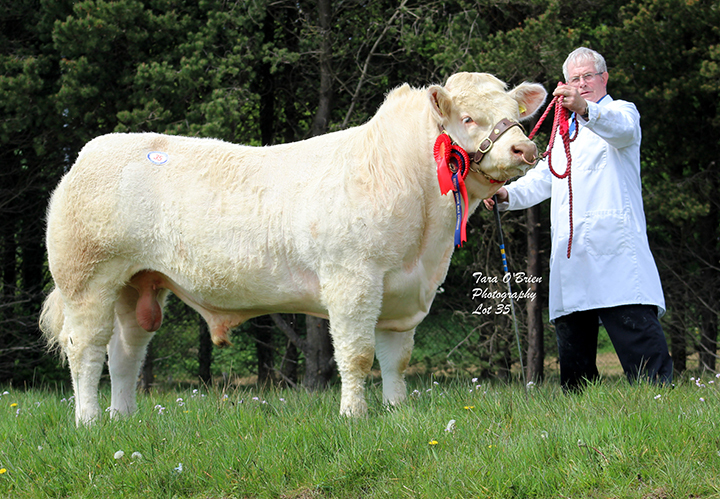 An August 2016-born son of the Irish-bred Crossmolina Euro and the homebred Carrgene Gemma, a Major daughter, Muckian had also been awarded the overall male championship and senior male champion rosettes earlier in the day and secured a 4,200gns bid for breeder and consigner Eugene Muckian, Silverbridge, Co Down. Next in the trade stakes at 3,700gns was the 16-month-old Dartonhall Milan, who is sired by the 12,000gns Maerdy Fiend. An entry from John Erskine, Killylea, Co Armagh, Milan’s dam is the 7,000gns Stirling female champion Vexour Galina, who goes back to the 30,000gns Dingle Hofmeister, he was purchased by J Martin, Staramore, Co Armagh. Just behind at 3,600gns was an entry from Balfour Brothers, Bellanaleck, Co Fermanagh, who was purchased by ST Scott, Enniskillen, Co Fermanagh. The October 2016-born Clonatrig Max is sired by Doonally New and out of Blelack Digger daughter Clonatrig Ida. 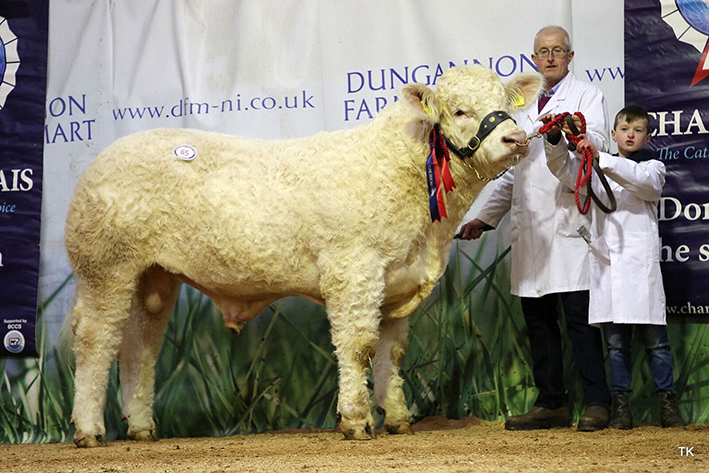 Two bulls were knocked down at 3,500gns a piece with the first coming from Vincent Cunningham, Dromore, Co Down. Class winner Cunnsallagh Macduff is by the well-known AI sire Indurain, while the dam is Cunnsallagh Edna, a cow by the Balmoral Show M&S Beef interbreed winner Sandelford Bergkamp. The 20-month-old Macduff goes home to work in Stewartstown, Co Tyrone for K Watters. Matching the 3,500gns price tag was the September 2016-born Killadeas Magna, who was tapped out second in his class, for breeders and exhibitors Stuart and David Bothwell, Ballina Mallard, Co Fermanagh. 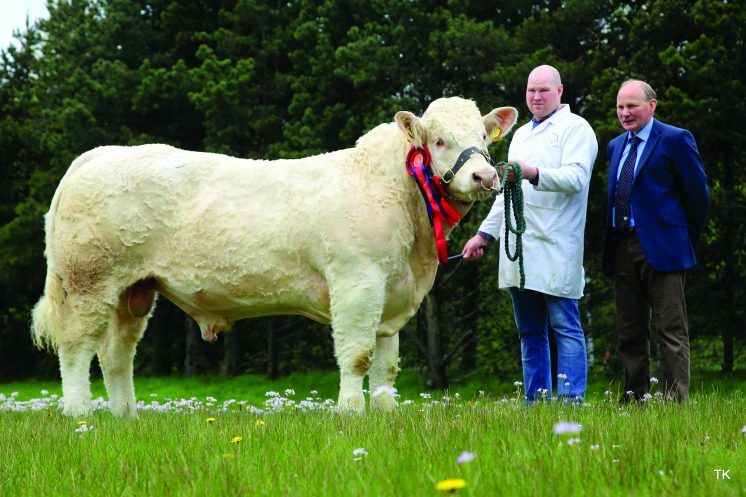 A Hillan, Broughshane, Co Antrim, was the man who forked out the cash for this son of the 16,000gns Stirling supreme champion Blackford Dynamite and Killadeas Bea, a daughter of the Omagh Show supreme champion and Royal Ulster Show reserve supreme champion Derrygiff Mills. Following on at 3,400gns was Moorlough Marco. G Cutler of Florencecourt, was the successful bidder of this yellow-ticket winner and took him home to his Co Fermanagh-based unit. This 15-month-old lad from John McBride, Strabane, Co Tyrone, is by the 10,000gns Portadown supreme champion Moorlough Palo, while the dam is the Doonally New-sired Moorlough Hannah. Another from John McBride was the first to secure the next highest price of 3,200gns. Moorlough Mecca, a 16-month-old, sired by the 12,000gns Maerdy Fiend and out of Moorlough Isla, who goes back to the 16,000gns Stirling junior champion and Caithness Show supreme champion Clyth Diplomat, was purchased by George Ewart, Killylea, Co Armagh. 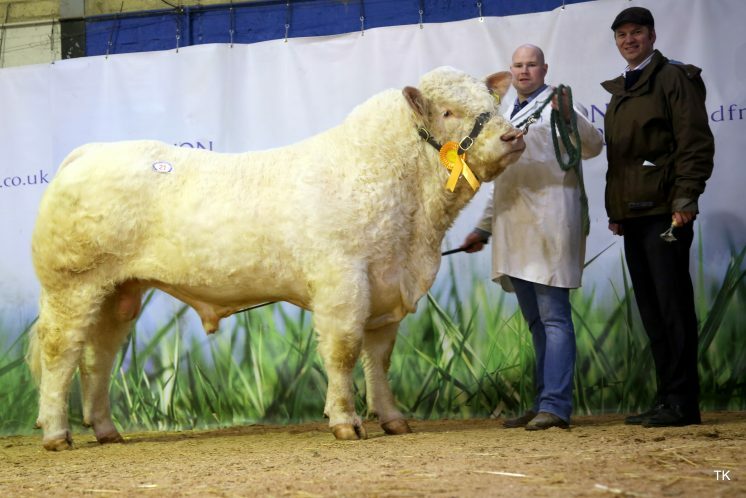 The second to be knocked down at 3,200gns was a yellow-ticket winning entry from the aforementioned Will Short. Woodpark Minstrel, a 21-month-old who was purchased by S Campbell, Bellaghy, Co Derry, is a 2007-born son of the 19,000gns Doune and Dunblane champion Corrie Alan bred out of Woodpark Guinevere, a Begonia daughter. 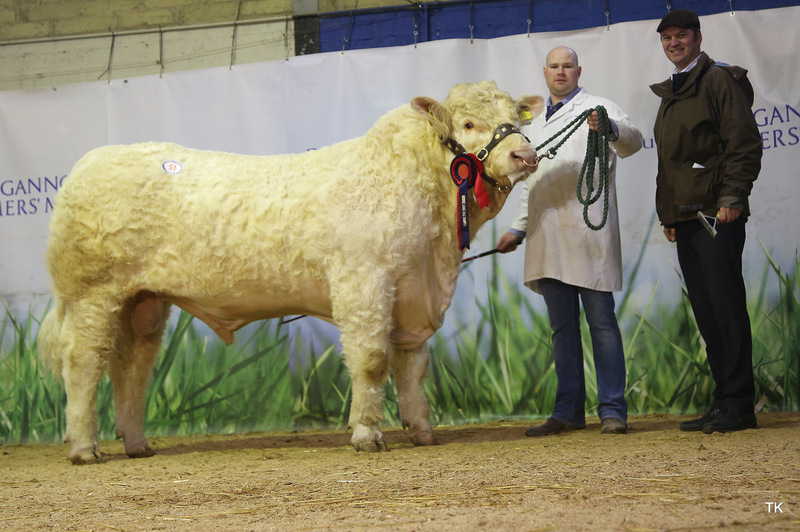 A trio of bulls sold for the next highest price of 3,100gns and the first was Tullyconnaught Mel. The breeding here includes the 18,000gns Thrunton Fairfax on to the home-bred Tullyconnaught Daisy, who goes back to the 15,000gns Carlisle supreme champion Burradon Talisman. The September 2016-born Mel was another purchased by judge Terry Coghill, this time for Mr Ritch, Sandwick, Orkney from Mr James Pyers, Corbet, Co Down. 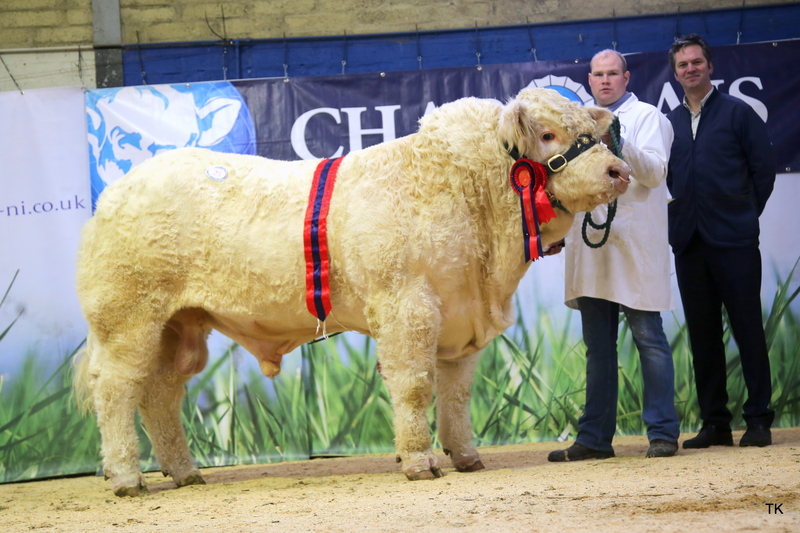 Also hitting the 3,100gns price tag was William Whyte’s Innisrush Magic from Portglenone, Co Antrim. Another Blelack Digger son this time out of Innisrush Gem, a daughter of the 55,000gns Balmoral Show interbreed champion Sportsmans Columbo, this September 2016-born lad caught the eye of Michael Mullin, Dungannon, Co Tyrone. Another to secure 3,100gns when knocked down to Michael Quinn, Cookstown, Co Tyrone, was the 16-month-old Glenramble Mark, an entry from Thomas O’Neill, Claudy, Co Derry. Mark is sired by the 12,000gns Carlisle reserve senior champion Wesley Equinox, while the dam is the Dromiskin Viceroy-sired Glenramble Honey. Another trio secured matching price tags, this time at 3,000gns a piece. Derryharney Murray from the above-mentioned Harold Stubbs and grandson Alan Burleigh was the first, and was purchased by G Campbell, Dungannon, Co Tyrone. Murray is bred from Thrunton Bonjovi daughter Derryharney Imlucky, sired by Goldies Eddy and was 17-month-old on the day of sale. 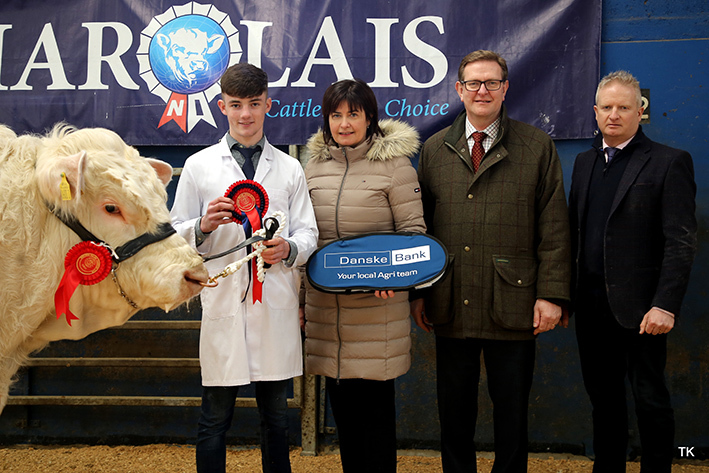 The second 3,000gns bull was the October 2016-born Drumacritten Marcus, who goes home to work in Downpatrick, Co Down, for his new owner C Montgomery. Marcus is sired by the 16,000gns Stirling junior champion and Caithness Show supreme champion Clyth Diplomat, is out of Drumacritten Angel, a Lisnalurg Ignot daughter and secured a yellow rosette for vendor George Nelson, Rosslea, Co Fermanagh. Matching the 3,000gns price tag was a class winner from the O’Kane Bros of Lower Ovill, Co Derry. 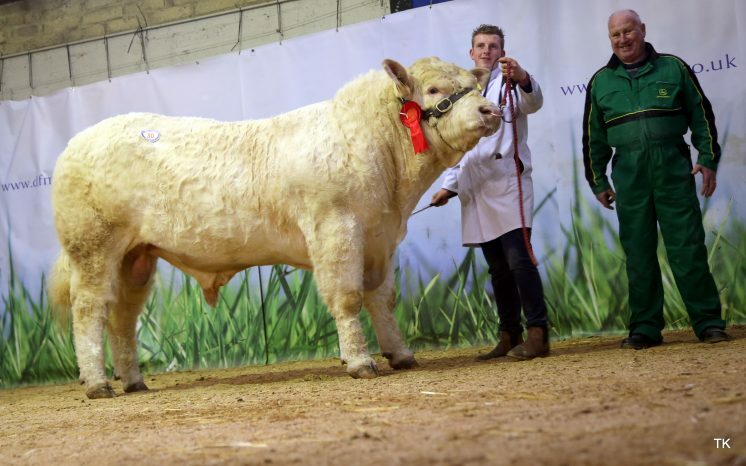 Ovill Mahon who is a 16-month-old lad out of the 55,000gns Balmoral Show interbreed champion Sportsmans Columbo daughter Ovill Gwynne, and sired by the home-bred Ovill Instant went home with an undisclosed bidder. The female section was topped by the female champion at 3,100gns. 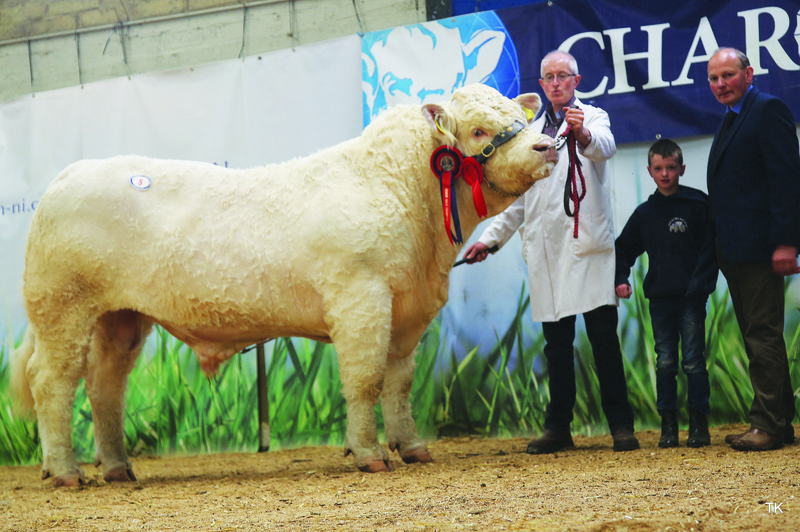 The 21-month-old Brogher Mygirl from Mr T Phair, Bellanaleck, Co Fermanagh was purchased by Andrew Dunne, Kinawley, Co Fermanagh, for his 2014-established Charolais herd. Mygirl is another sired by Blelack Digger and out of the Lyonsdemesne Tzar daughter Brogher Fancygirl. 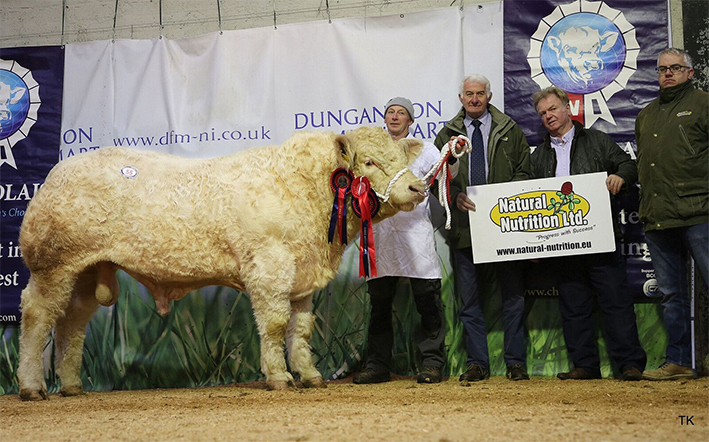 A bumper show of Charolais backed by soaring demand produced a record breaking trade at Dungannon on Friday 3 November, at the Northern Ireland Charolais Club Autumn sale. 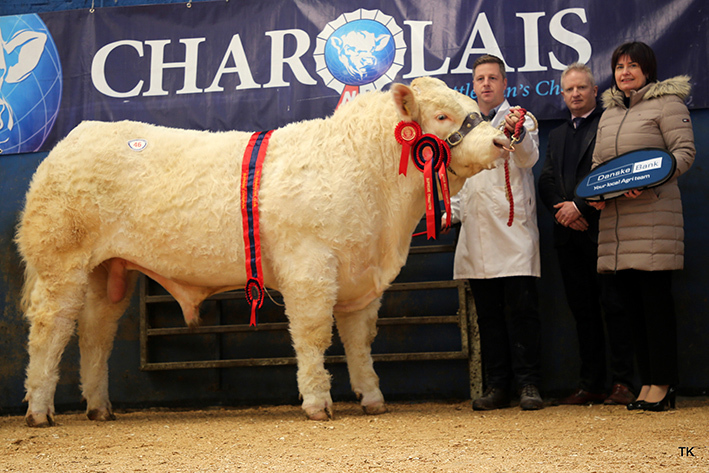 Bidding peaked at 8,000gns in both the male and female sections and 26 bulls sold to an average of £3,428.65. 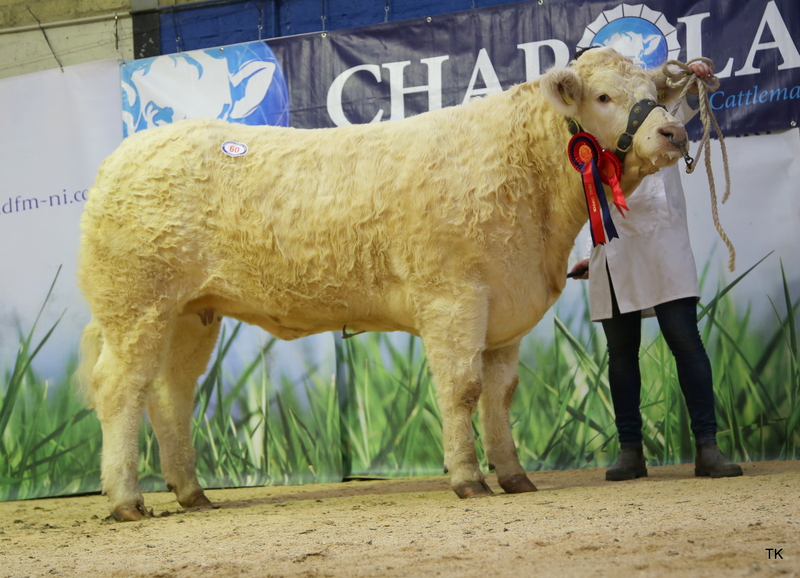 The 8,000gns secured for the trade topping female Battleford Lola is a Charolais sale centre record. 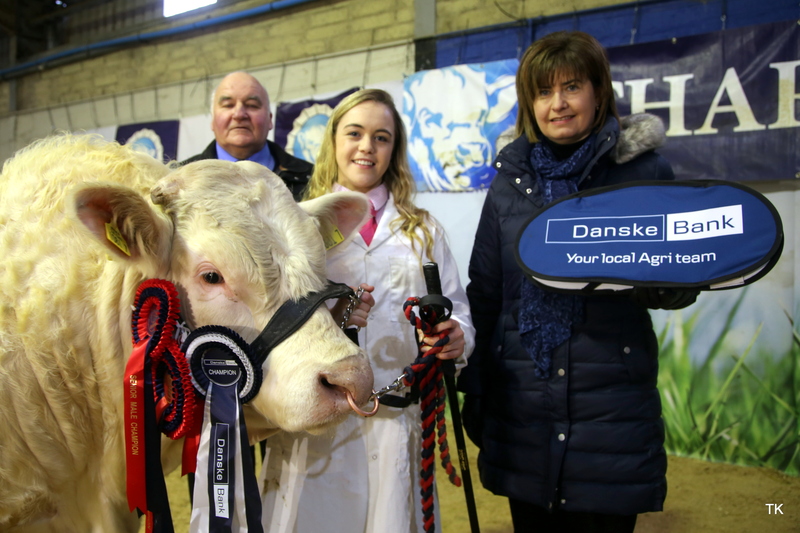 Leading the bids for the bulls at 8,000gns was the May-2016-born Mountjoy Morgan, who had been tapped out first in his class at the pre-sale show for breeder and consigner Caldwell McAskie, Mountjoy, Co Tyrone. Morgan is sired by the Royal Welsh reserve male champion Montgomery Ianto and is out of the homebred dam Mountjoy Ultra who goes back to Gaer Positive. He goes on to work in Derryhouse, Co Armagh for Messrs McGinnity. 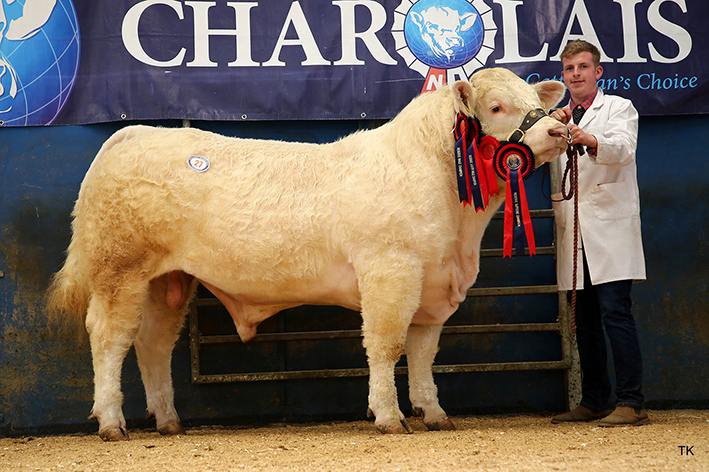 The supreme, male and senior champion Coolnaslee Martin was next in the trade stakes at 6,000gns. 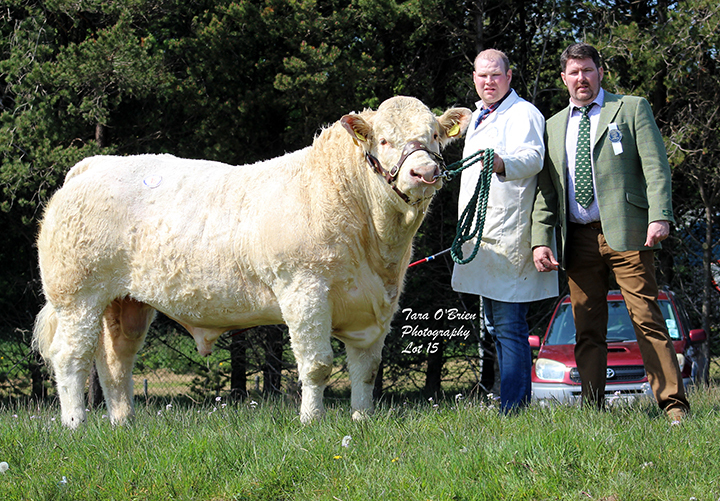 He was exhibited by herd manager Stuart Wilson on behalf of his owner and new custodian of the Coolnaslee herd Jonathan Crawford, Maghera, Co Derry, son of the late Gilbert Crawford. The 17-month-old Martin was snapped up by Seamus Conroy, Tassagh, Co Armagh, and his breeding includes his sire, the 10,000gns Carlisle intermediate champion Ratoary Icebreaker, who is rated amongst the top five percent of the breed for calving ease and dam Coolnaslee Gina who in turn is sired by the Balmoral Show supreme champion Goldies Carnival. Another entry from Mr Crawford sold for 4,400gns. Coolnaslee Max a June-2016-born son of Ratoary Icebreaker and the Goldies Carnival sired Coolnaslee Honor was purchased by S Windrum, Ballygowan, Co Down. Commanding a 5,200gns bid from the Rogers Family, Ballynahinch, Co Down, was the reserve senior male champion Sandelford Mason from breeder and exhibitor George Henderson, Revallagh, Co Antrim. The 17-month-old Mason is sired by the 13,000gns Stirling reserve intermediate champion Conval Frank and out of Sandelford Fern, a daughter of the 14,000gns Goldies Usher. Liam Johnston Mountain herd from Tempo, Co Fermanagh was behind the next transaction, when Mountain Magnificent was purchased by Messrs McKeagney, Maghera, Co Derry for 5,000gns. Magnificent who was tapped out third in his class at the pre-sale show, is a 16-month-old son of the Ballymena Show champion Derrygiff Jester and the Oscar sired Derrygiff Clare. The next highest price of 4,200gns was bid by James Watson, Portadown, Co Armagh for one of the youngest lots of the sale. The 12-month old Brogher Major who stood second in his class earlier in the day for consigner Trevor Phair, Bellanaleck, Co Fermanagh, comes from show-winning breeding, being sired by the 12,000gns Carlisle reserve senior champion Wesley Equinox and bred out of the Fintona Show class winner Brogher Gigi who goes back to the 55,000gns Balmoral Show interbreed champion Sportsmans Columbo. 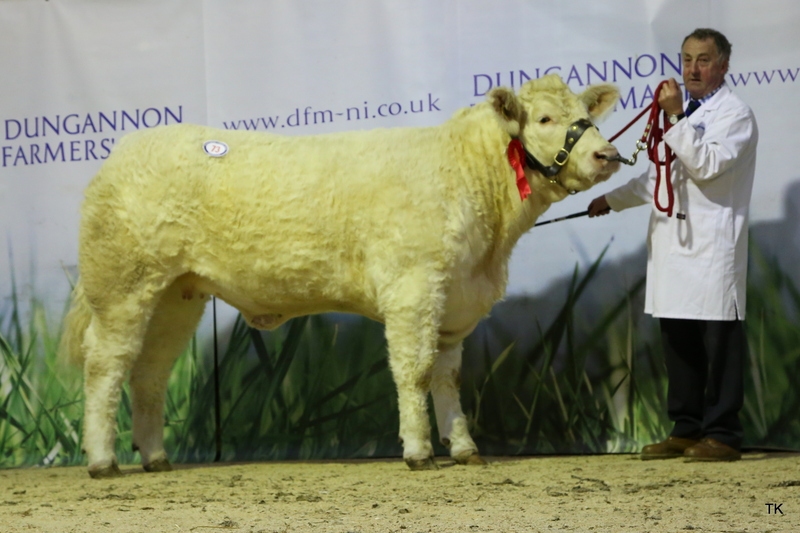 Just behind at 4,100gns was the February-2016-born Cunnsallagh Mick from Vincent G Cunningham, Dromore, Co Down. 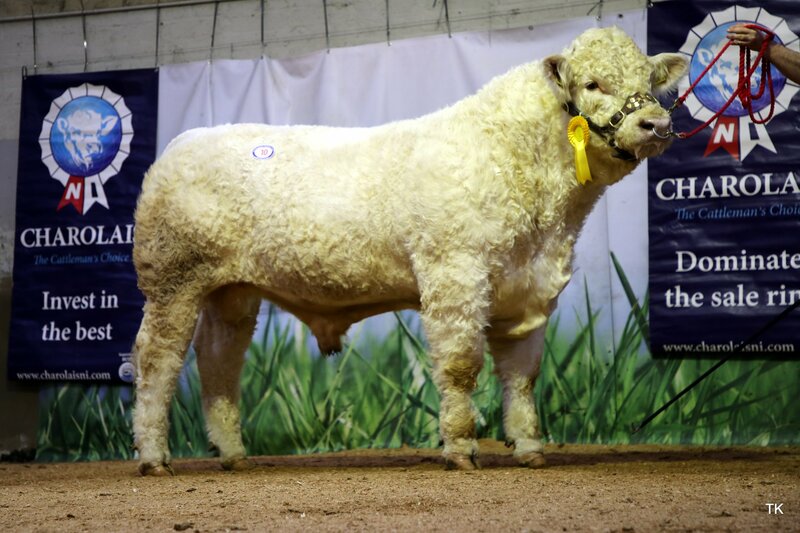 This son of the 16,000gns Stirling junior champion Clyth Diplomat and homebred, Pirate sired Cunnsallagh Hermoine attracted a bid from Liam Mullan, Coleraine, Co Tyrone. Staying local when snapped up by Robert O’Neill, Dunloy, Co Antrim was a yellow ticket winning entry from John Currie, Ballymena, Co Antrim. Tullygarley Marco, a June-2016-born by Davally Illusion and out of the Blakestown Endorse sired Tullygarley Harriet was sold for 3,600gns. An 18-month-old son of the 10,000gns Perth supreme champion Thrunton Bonjovi, bred out of Ballymather Ivy, a Coolnaslee Asprey daughter, was next in the trade stakes at 3,100gns. Ballymather Matrix from Ian Rea, Nutts Corner, Co Antrim was purchased by WJ McClenaghan, Drumreagh, Co Down. 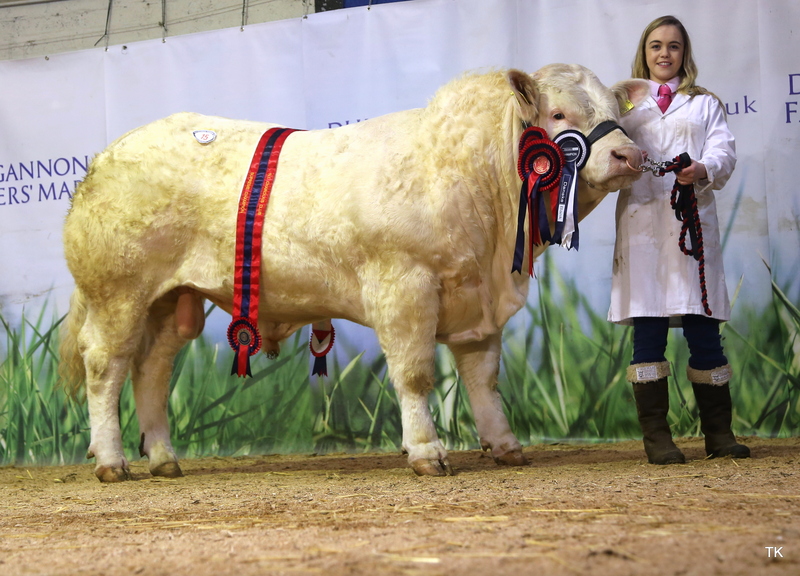 The star of the female section was the two-year-old female champion Battleford Lola ET, who broke the sale centre record for Charolais females when she was knocked down at 8,000gns. This entry from Bartley Finnegan, Moy, Co Tyrone, who is sold in-calf to Blelack Immaculate, will be travelling across the water with her new owner Blair Duffton from Huntly, Aberdeenshire. She is sired by the Black Isle Show champion Lochend Apache and her dam Blelack Usp is sired by the 25,000gns Perth supreme champion and Royal Show junior male champion Thrunton Socrates. Attracting a bid of 5,000gns when she was purchased by Clare Ferris, Millisle, Co Down, was the 19-month-old class winner Hillviewfarm Margo from Adrian Richardson, Maguiresbridge, Co Fermanagh. Margo who is sired by the renowned easy calving and popular Blelack Digger is out of Hillviewfarm Gina who goes back to the 14,000gns Royal Ulster Show junior male champion Killadeas Jack. The next three entries were all consigned by Robin and Agnes Todd, Corbet, Co Down. Firstly, selling for 2,600gns was the blue-ticket-winning Cappagh Lydia, sold served to Alwent Goldbar, the April-2015-born Lydia, by the 18,000gns Thrunton Fairfax and out of the 14,000gns Goldies Usher daughter Cappagh Esther, caught the eye of David Adams, Portglenone, Co Antrim. Matching the 2,600gns price tag for the Todd family was the 25-month-old Cappagh Lois, this time going home to Teer, Co Down, with Phelim and Bronagh Caragher. The Blelack Goldenboy sired Lois, whose dam Cappagh Dawn is sired by 15,000gns Carlisle Supreme champion Burradon Talisman ,collected a yellow ticket at the pre-sale show and is sold served to the aforementioned Conval Frank. Mr and Mrs Todd went on to secure 2,500gns for another 25-month-old Goldenboy daughter, this time out of the Burradon Talisman sired Cappagh Divine. 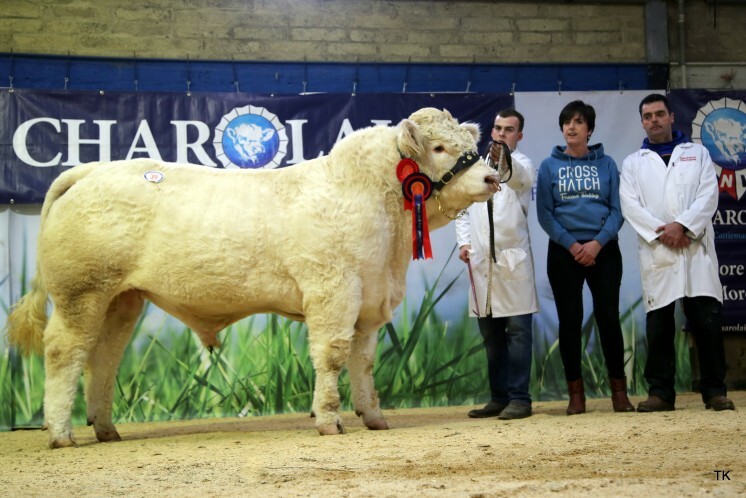 Cappagh Lily who is in-calf to Davally Illusion was purchased by Stephen McGuinness, Greysteel, Co Derry. The final lot to make 2,500gns was Drumlone Marina, who had placed second in her class for breeder and exhibitor Kenneth Veitch, Lisbellaw, Co Fermanagh. 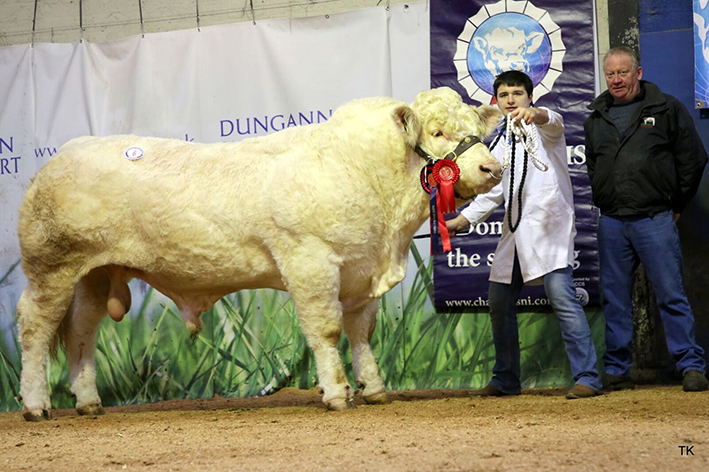 Micheal McVeigh, Dungannon, Co Tyrone, was the man with his hand in the air when the hammer when down on this January-2016-born, Pirate sired daughter of the Irish-born Doon Eleonora, who in turn is sired by the 18,000gns Perth intermediate champion Fury Action. Female Champion, Battleford Lola ET for Barley Finnegan. Stuart Wilson & Jonathan Crawford with the Senior & Overall Champion of the Show Coolnashee Martin. David Bothwell with Junior Champion & Reserve Overall Champion Killadeas Magnet. Reserve Senior Champion for Gary Henderson with Sandelford Mason. HillviewFarm Margo, Junior Heifer Class winner for L.Richardson. 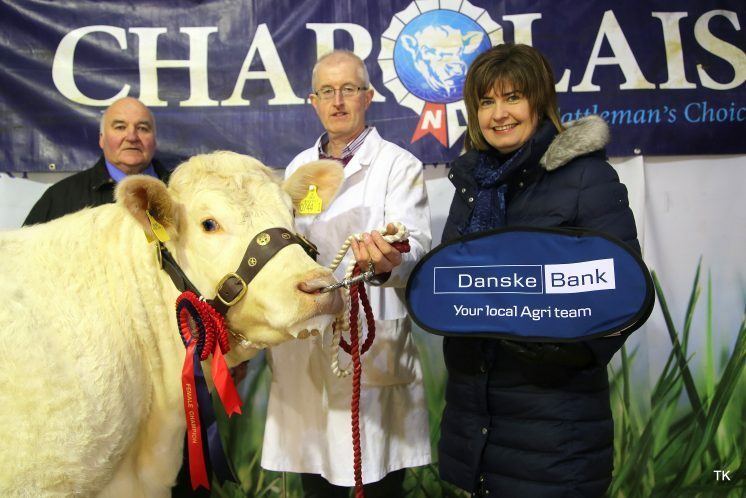 Charolais bulls met with a ready trade in Dungannon on Monday 1 May, topping at 5,200gns with a clearance rate of 93%, up 17% on the year for 2 more sold. Following the recent Charolais sales trend averages were also up by £360 to £3,182. Topping the lots and securing a price of 5,200gns from S Quigg, Garvagh, Co Derry was the pre-sale show reserve male champion, an entry from John McGrath, Dromore, Co Tyrone. The 14-month old Drumconnis Marvel is a son of the 28,000gns Stirling supreme champion Elgin Glenlivet and Scottish born dam Loganbar Hemisphere. Next in the trade stakes was the November 2015-born Coolnaslee Largolf whose breeding includes the 12,000gns Maerdy Fiend and maternal grandsire the 55,000gns Balmoral interbreed champion Sportsmans Columbo. Largolf who commanded a 4,900gns bid from Norman Johnston, Enniskillen, Co Fermanagh had been awarded a yellow ticket earlier in the day for breeder Gilbert Crawford, Maghera, Co Derry. Mr Crawford went on to secure the reserve supreme and male championships with his 15-month old entry Coolnaslee Master who is no stranger to the show ring having secured the Pedigree Calf Fair reserve junior championship back in November. The 22,000gns Newhouse Bigal is the sire here and the home-bred dam again goes back to Columbo. Stephen McGuinness, Greysteel, Co Derry were the purchasers at 4,600gns. Just a few lots earlier Glenbuck Lawyer had secured a 4,700gns bid from Seamus McMullan, Bellaghy, Co Derry. Lawyer a December-2015 born entry sired by Blelack Digger had been awarded a red rosette in the show for Robin O’Mullan, Rasharkin, Co Antrim. Another class winner this time from breeder Kenneth Veitch, Lisbellaw, Co Fermanagh realised the next highest bid of 4,000gns and the man with his hand in the air as the hammer went down on this one was Eric J Connor, Maghera, Co Derry. The 18-month old Drumlone Lindsman is a son of the French AI sire Plexus and the homebred Drumlone Hilary. The next top priced at 3,800gns and purchased by HP Nugent, Toomebridge, Co Antrim was the 18,000gns Thrunton Fairfax son Royaldowns Legend, a December-2015 born entry from Mervyn McKeown, Downpatrick, Co Down. Next and selling for a price tag of 3,300gns, J, MN and SP Bradley, Plumbridge, Co Tyrone offered their 15-month old Slievemore Mugsy. The 18,000gns Perth intermediate champion Fury Action sired this lad who was snapped up by Seamus McMullan, Bellaghy, Co Derry. 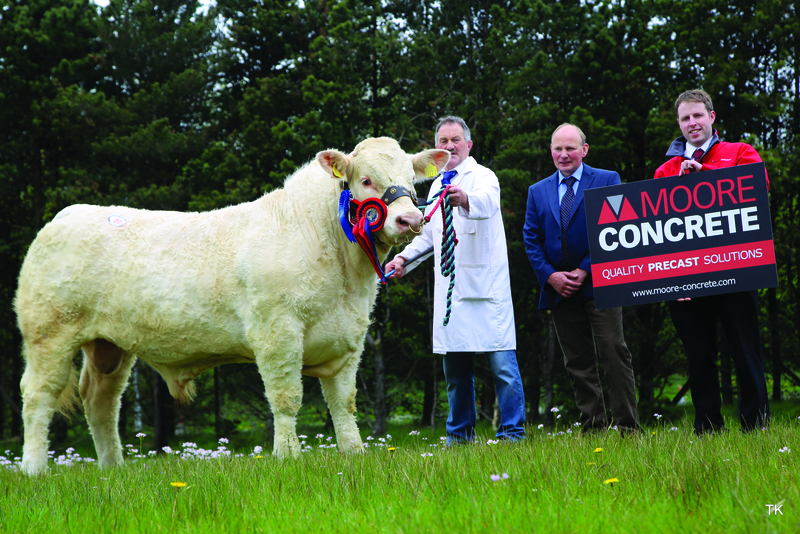 Just two lots later Harold Stubbs and Alan Burleigh, Crummy, Co Fermanagh sold their Minsups reserve junior bull champion Derryharney Major. 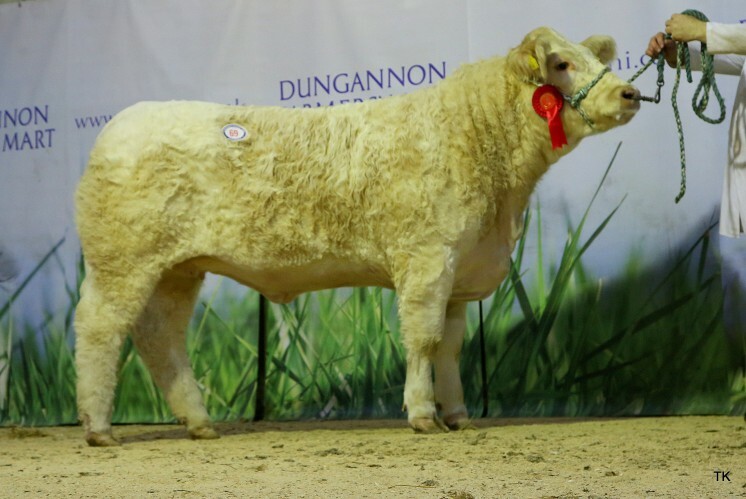 The January-2016 born Major who is sired by Allanfauld Vagabond and out of Derryharney Dancer who goes back to the 13,000gns Perth junior champion Simpsons Gregg, caught the eye of Andrew Millar, Antrim, when he was placed second in his class at the pre-sale show. Another blue ticket winner this time exhibited by Jeremy Paynter, Hockley, Co Armagh, was the first of three to secure a price of 3,100gns. The 16,000gns Royal Welsh Show reserve male champion Anside Foreman son and 16-month old Drumilly Landrover was purchased by R Hylands, Limavady, Co Derry. Matching the 3,100gns price tag was the February-2016 born Kiltybane Misterlucky sired by Doonally Nicefor and out of the home-bred Kiltybane Icity. Desmond Rafferty, Carrickmore, Co Tyrone bought this one from breeders and exhibitors Seamus & Aiden Bellew, Cullyhanna, Co Down. 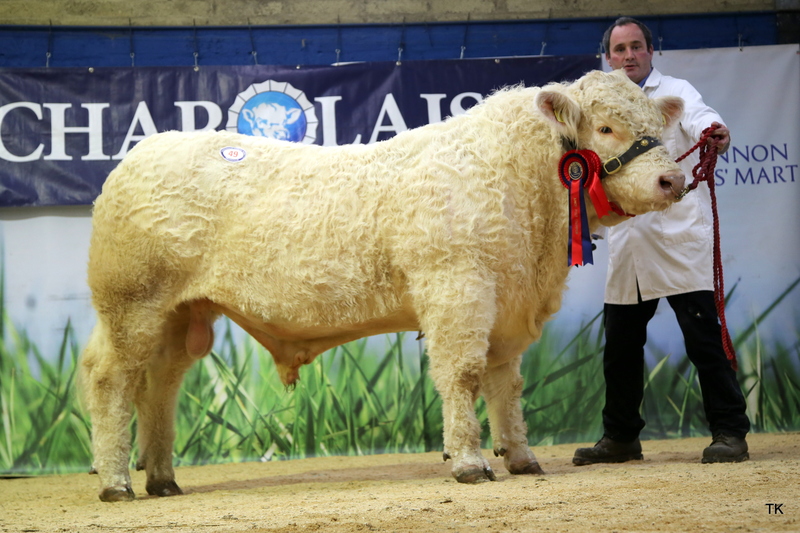 The third lot to sell for 3,100gns was a 14-month old entry from William and Margaret Nelson, Rosslea, Co Fermanagh. 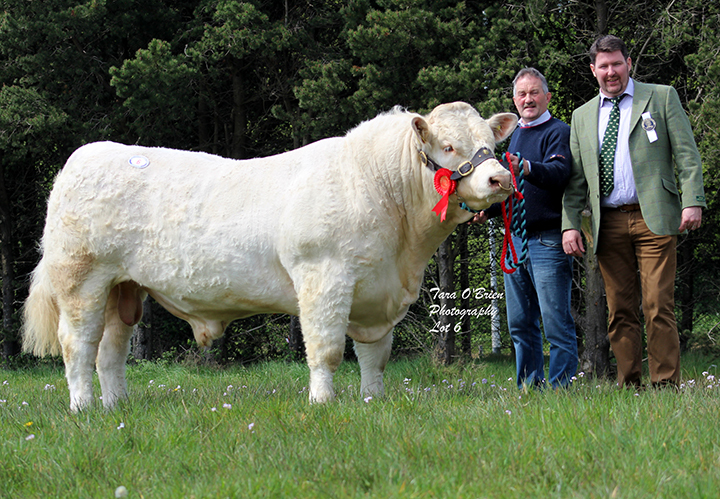 The 22,000gns Newhouse Bigal sired Drumacritten Mark journeys on to work at Randalstown, Co Antrim with Brian Smyth. The female lots were topped by an entry from Harold Stubbs and grandson Alan Burleigh of Crummy, Co Fermanagh who earlier in the day were awarded the supreme and female championship for their 15-month old Doonally New daughter Derryharney Moonlight who was snapped up by H and H Heron, Newtownards, Co Down for 3,300gns. 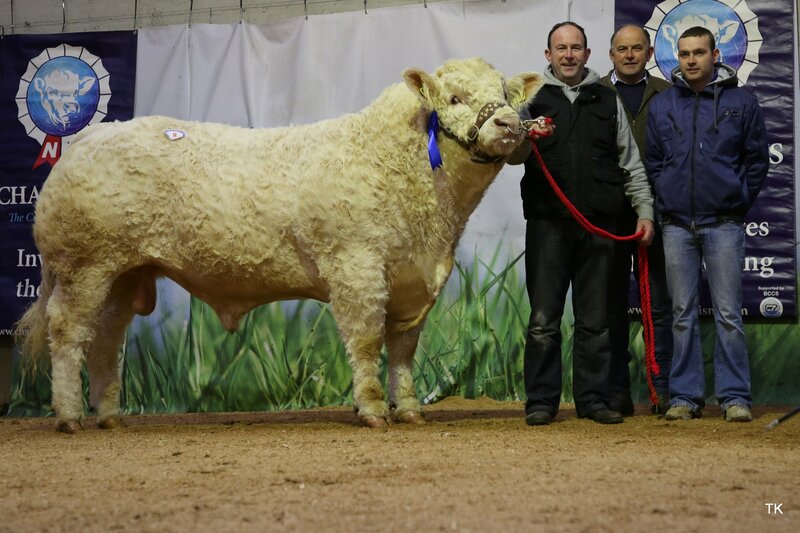 The Heron family were in a buying mood and went on to purchase the reserve female champion Killadeas Lottie, an August-2015 born lass sired by easy calving Blelack Digger from breeders and exhibitors Stuart and David Bothwell, Ballina Mallard, Co Fermagh.